Please accept my apologies for the missing winner’s post this week. Some unexpected events popped up and one of the casualties has been the Angry Hourglass. I plan to do a double winner’s post as well as double up on the HumpDay Quickie next week, but in the meantime, since I neglected to rescue one of last week’s entries from the spam goblins in time to be judged, here’s a bonus story to tide you over until this weekend. It’s the hug that finished it. Arms around me like bands of steel, hot breath searing my neck. The heaviness of his head forcing mine downwards as the ground rose up to suffocate me. I could only see the chains of domesticity dangling in front of me. I was terrified. My arms limp, fingers caressing the daisies hidden in the grass like ancient overturned gravestones. Whispering in my ear he said the word I’d been dreading. I tried to breathe gulping air into my constricted lungs. I couldn’t push away. Hadn’t I been working for this all my life? Twenty five years! The counsellor had told me how to deal with my underlying anxiety. It was easy just concentrate on breathing. I gasped for air and shook my head. He reached into my bag and passed me the blue inhaler. I wasn’t ready. The strong steroids soothed my lungs air passing down into the bronchioles. I felt stronger but not fit for a battle to end a war. I shuddered. I’d never shared anything in my life not even my parents and I wasn’t going to start now. Yes, I know. The Angry Hourglass has only just returned, and here I am asking about taking more time off. Ridiculous! In any case, I’m always happy to post photo prompts over holiday weekends, but in fairness to those who submit work and those who volunteer their time to judge, I want to ensure that there is a reasonable turnout for everyone. With that in mind, both Christmas and New Years fall over the weekend this year. Before I ask folks to volunteer their holiday weekends to judge, please indicate which weekends (if any) you will be unavailable for either writing or judging. You can also message me directly if you prefer. Thanks much! I’m dressing for Halloween, getting my shimmer on. “Looking good,” says Shen, but my roommate’s not actually looking at me. Amir’s coming over in an hour. They’re going as Barack and Michelle and will be handing out “Please Vote!” stickers. Cute. My eyes are larger now, emerald, with gold specks and sultry long lashes. Shen will be gone by the time I’m done. She won’t see that they also glow in the dark. She never sees me anyway. “You coming to the party?” Shen asks. “What party?” It’s a joke; I know what party she means, the big one that requires tickets and nepotism, neither of which I have. Maybe she’ll invite me. When hell freezes over, I’m thinking. Shen laughs, twirling in her one-shoulder inauguration white. “You’re so weird,” she says. I’m working on my hood now, pulling and stretching black skin tight over my head. The pain almost feels good, liberating in a way that the other 364 days of loneliness can’t match. Soon my landfill-colored mop of hair, my acne-bombarded skin have vanished. Shen’s mirror tells me I look sleeker. Exotic. The slamming door is my only clue she’s gone; Amir must have texted from downstairs. Shen’s a thoughtful person, normally, volunteering at shelters, donating blood and the like; but she doesn’t know what to do with me. I don’t blame her. I don’t know what to do with myself, either. Darkness floods the city: at last I am ready. In the street are a peanut butter-and-jelly pair, a clown and a Freddie, a whoever-the-latest-Disney-princess-is, all chattering away, cramming their mouths and hearts in comforting sugared bliss. They don’t see me balancing on the balcony. They don’t see me stretching out my wings, plunging into the air, soaring over their ordinary, oblivious heads. They don’t hear me, now a mile, five miles, fifty miles up, roaring my freedom among the stars, dancing with Casseopeia, dodging Orion, wrestling serpents with Ophiuchus. And they won’t see me tomorrow, either, when Halloween is over and I wrench my cursed, outcast human costume back on. TRICK OR TREAT, FLASH DOGS! We are back a week early with a special relaunch edition of The Angry Hourglass. This weekend, you have your choice of four photo prompts. Write a story about the photo you like best, or combine elements of two or more for an extra challenge. Your judge this weekend is Jaime Burchardt. This is me, holding my first publication. It’s pretty exciting for me. 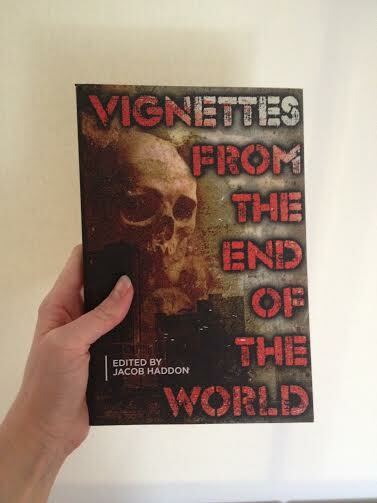 Some of you may have already heard, but for those of you who haven’t, my story, Zoe’s Last Birthday, is in Apokrupha’s doomsday anthology: Vignettes from the End of the World. It’s a lovely bit of flash fiction (I’m completely objective and in no way biased) and is featured alongside stories by George Cotronis and Richard Thomas, among others. Needless to say, I’m pretty freekin’ excited. If you are so inclined to read this awesome anthology, here are the links where it can be purchased.